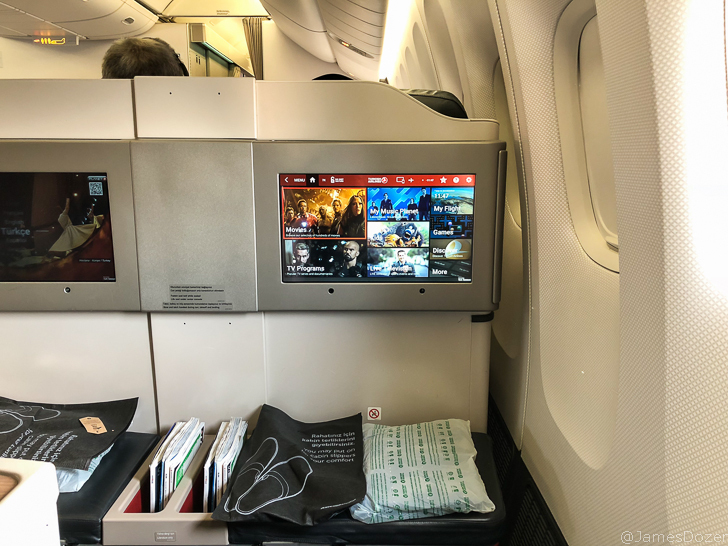 Turkish Airlines is one of my favorite airlines and it’s always a joy for me to fly with them. 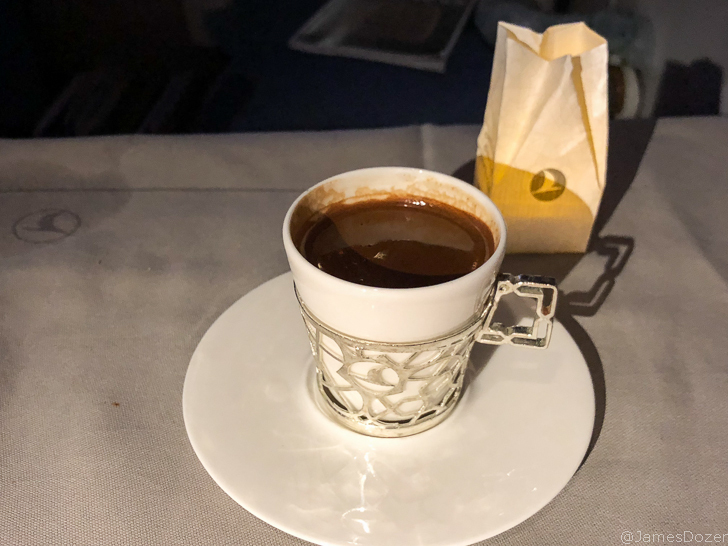 From their fantastic Do&Co catering and attentive service to their wonderful amenities provided onboard, Turkish Airlines consistently provides a quality in-flight experience for me. 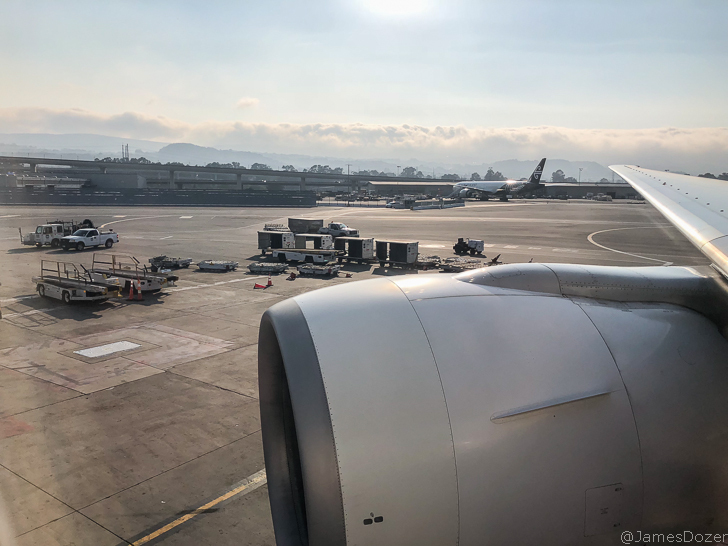 It doesn’t matter if I’m flying long-haul or short-haul, in business or in economy class, I have enjoyed every single flight with Turkish Airlines. 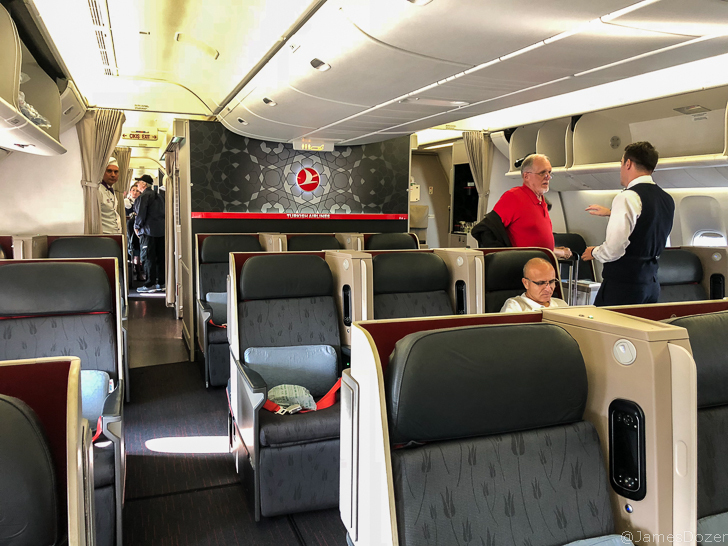 On this trip, I flew Turkish Airlines Business Class from San Francisco to Istanbul on a Boeing 777-300ER. 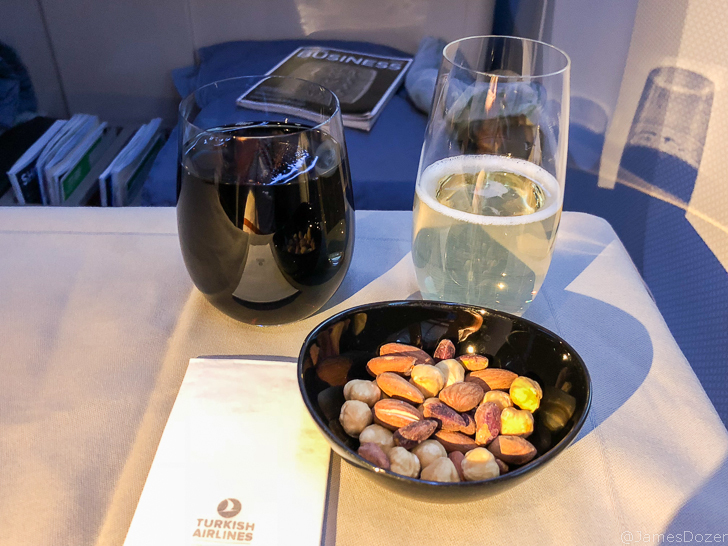 At San Francisco International Airport (SFO), Turkish Airlines contracts with the United Polaris Lounge for their business class passengers. 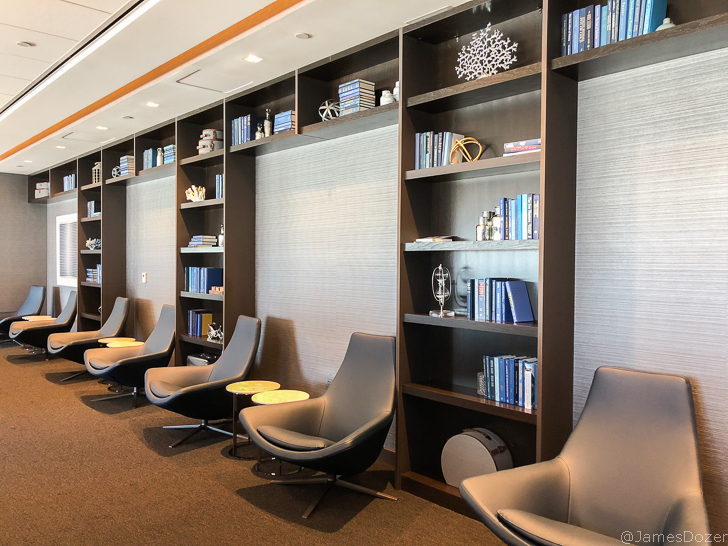 The new lounge is beautiful and offers premium cabin passengers a tranquil oasis with great spaces to rest, relax and recharge. 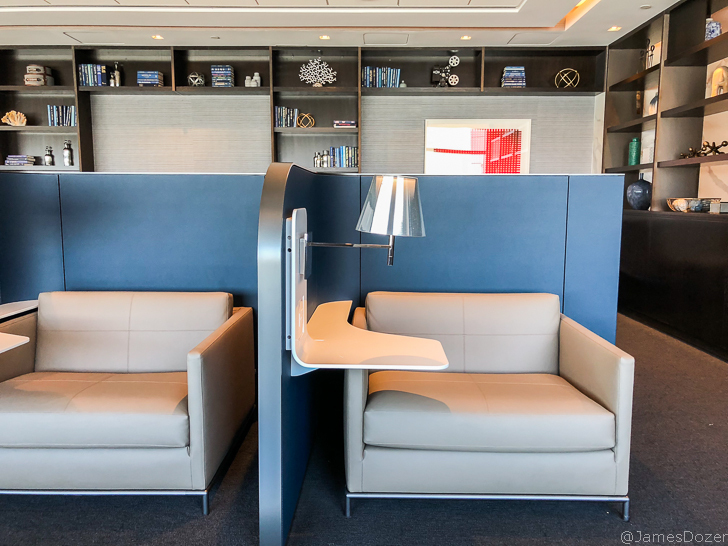 With spacious seating areas, quality amenities and a delicious a la carte menu, the new United Polaris Lounge will offer all passengers a delightful pre-flight experience before any long-haul flight. 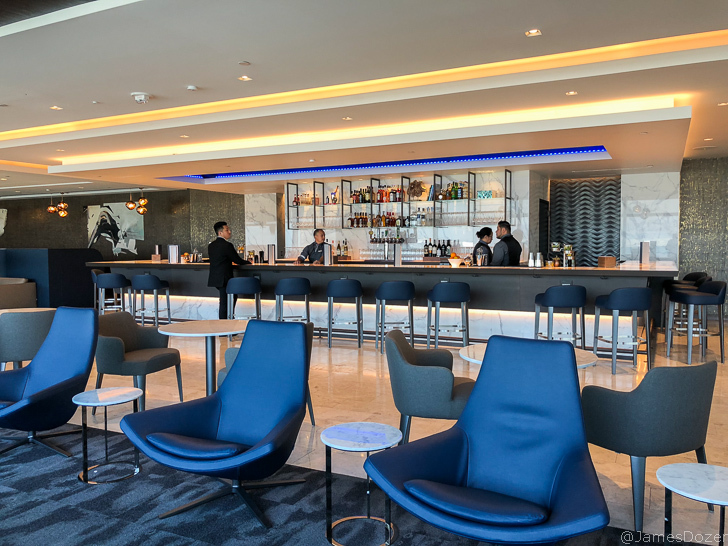 You can read my full review of the United Polaris Lounge in San Francisco by clicking here. Boarding for our 6:25 PM flight started at approximately 5:40 PM. Business class passengers boarded through door 1L and all other passengers boarded through door 2L. 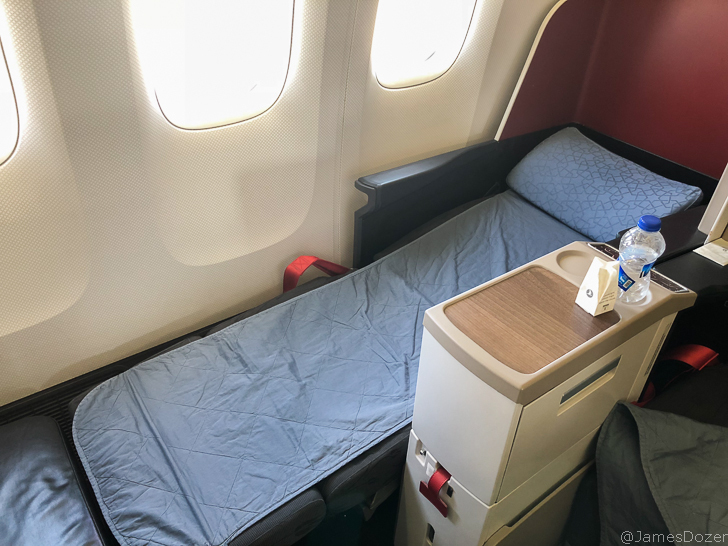 On their Boeing 777-300ER fleet, Turkish Airlines offers 49 forward-facing, lie-flat business class seats configured in a 2-3-2 layout. 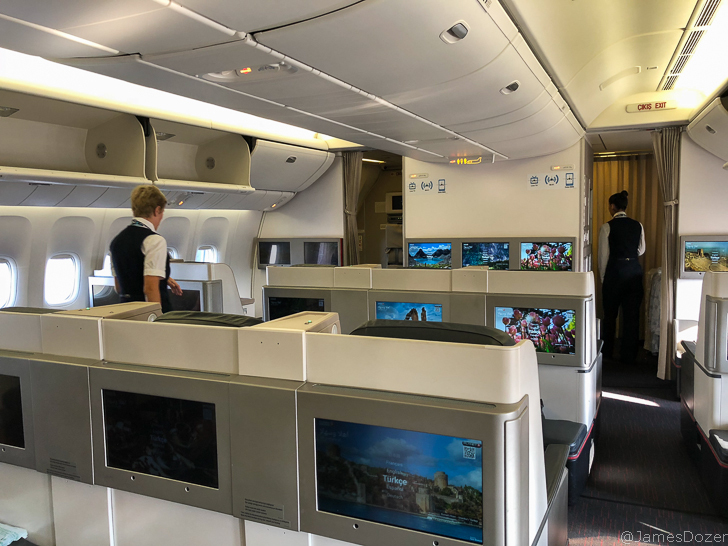 There are four rows of seats in the forward business class cabin and three rows of seats in the rear business class cabin. I will admit that I’m not the biggest fan of these Zodiac Aura 2015 seats. 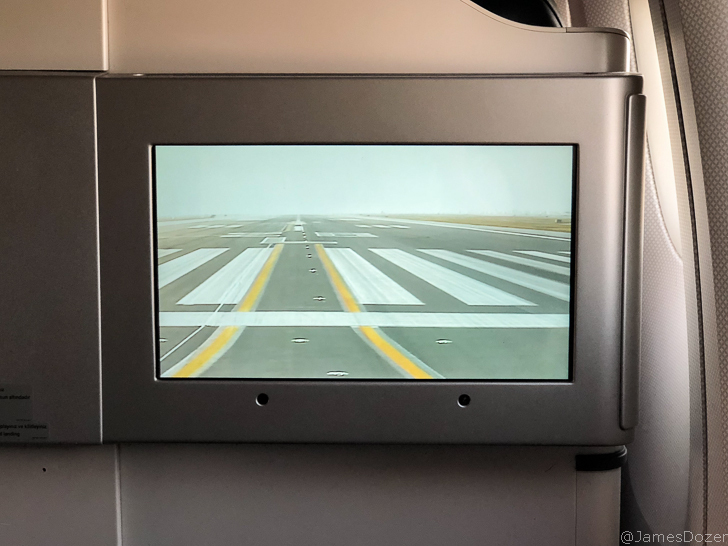 They are not terrible by any means but they lack privacy and do not provide direct-aisle access for all passengers. 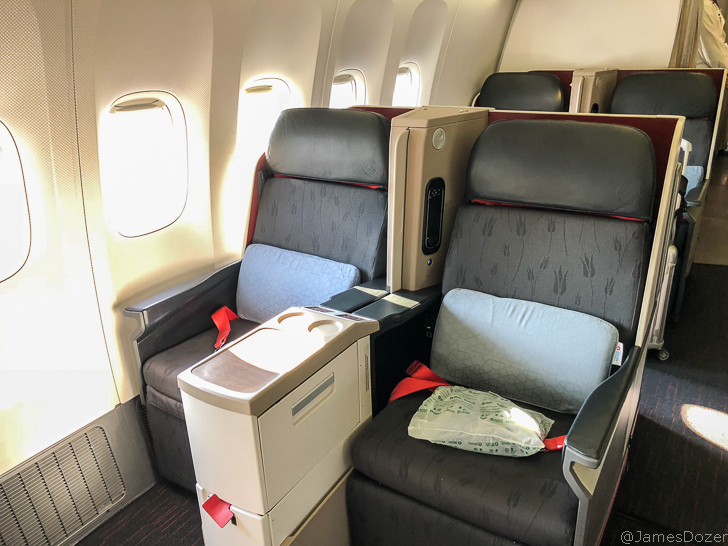 I really wish Turkish Airlines would move to a reverse herringbone layout like EVA Airways, Cathay Pacific or Virgin Australia on their Boeing 777-300ER fleet. 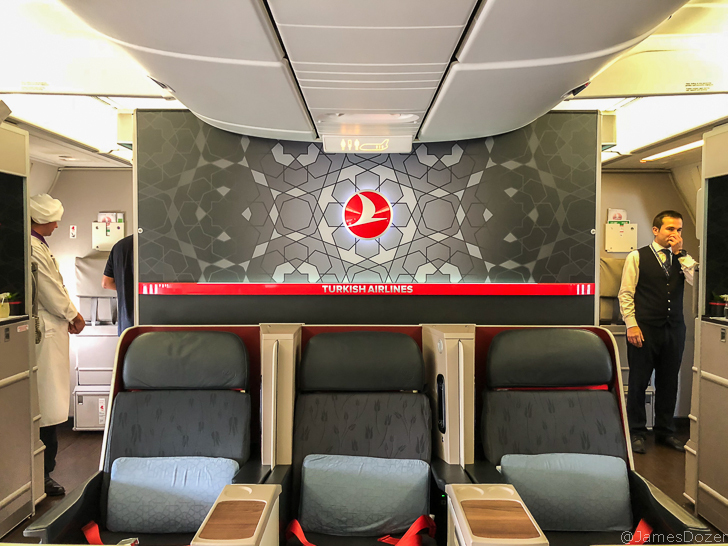 UPDATE: Turkish has just announced they will move to a 1-2-1 seating configuration on their Boeing 787/Airbus A350 fleet. No details have been released yet and there is no word on what will happen with their Boeing 777/Airbus A330 fleet. 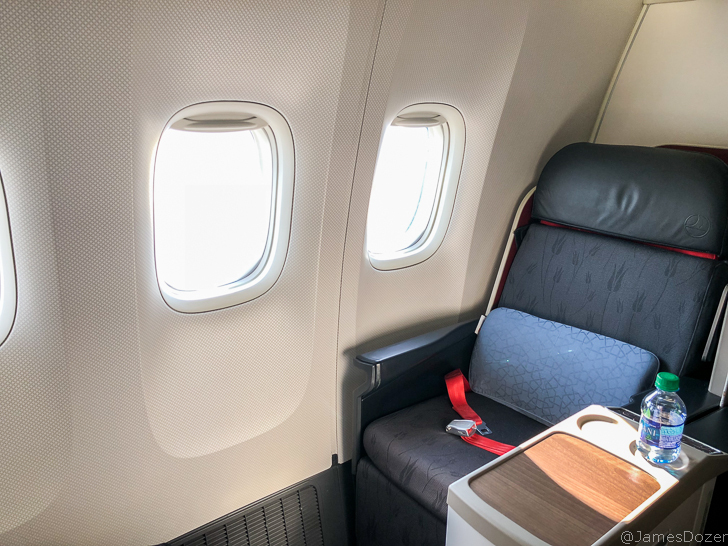 According to SeatGuru, these existing Turkish Airlines Business Class seats provide 22 inches of width and 78 inches of pitch. Notice the dreaded middle seat. 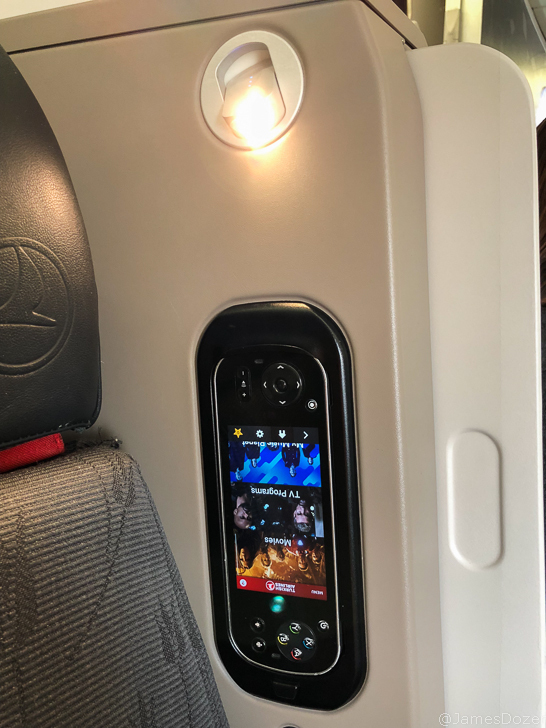 Each seat is configured with a personal in-flight entertainment (IFE) system, USB port, universal electrical outlet, and two individual reading lamps. 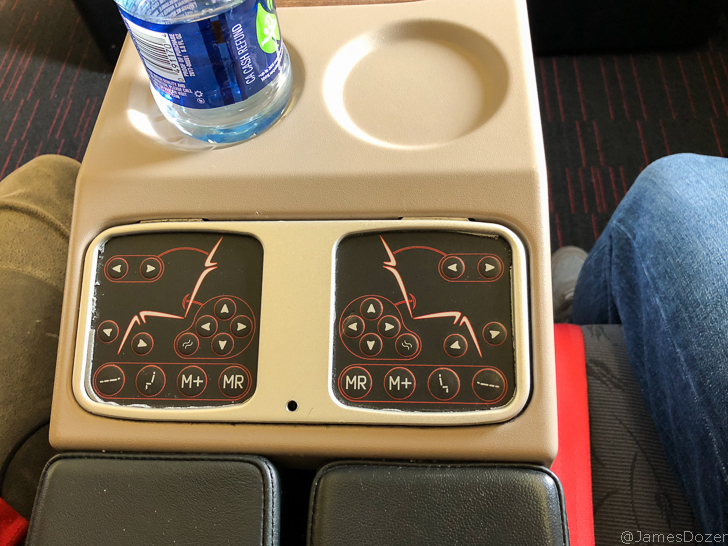 The IFE remote is positioned on the inside wall and the seat controls are located on the center armrest. 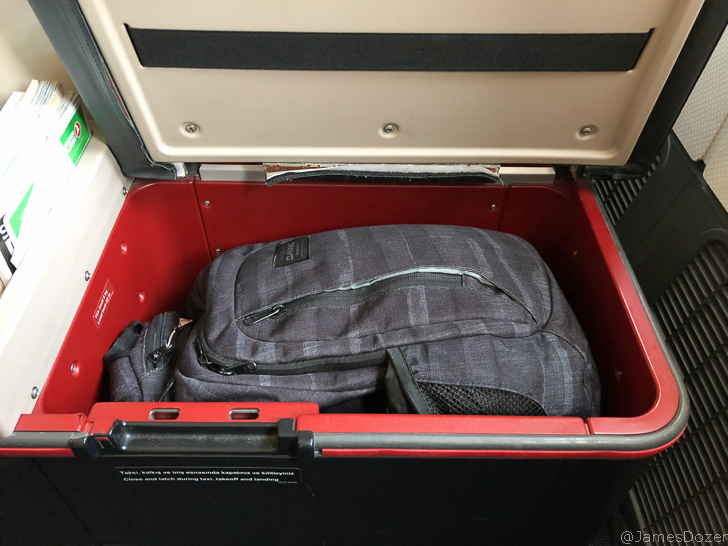 Storage-wise, your carry-on luggage can be stored in the overhead bins and your personal items can be stored in the compartment underneath the ottoman. The flip-top ottoman is large enough to secure a regular size backpack, purse or laptop case. The ottoman serves as storage space for your personal items and as an extension of your seat in bed mode. However, it is not intended as a seat for another passenger. 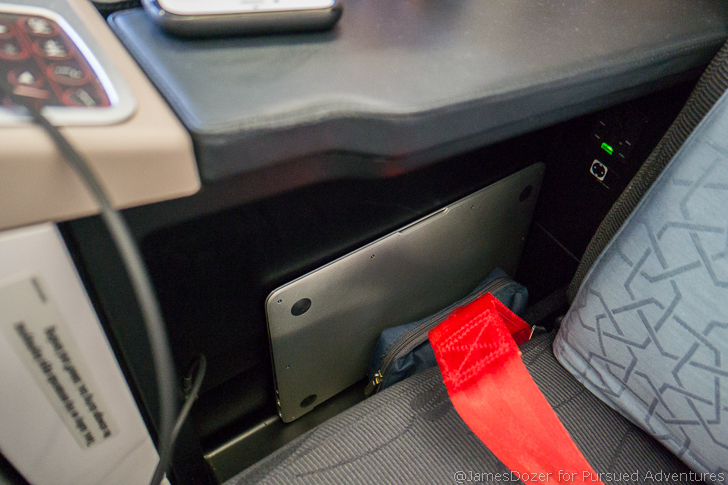 Your electronics and other small items can be stored in the single storage bin on the inside of your seat. The bin can accommodate laptops, headphones, cell phone, eyeglasses and other items. 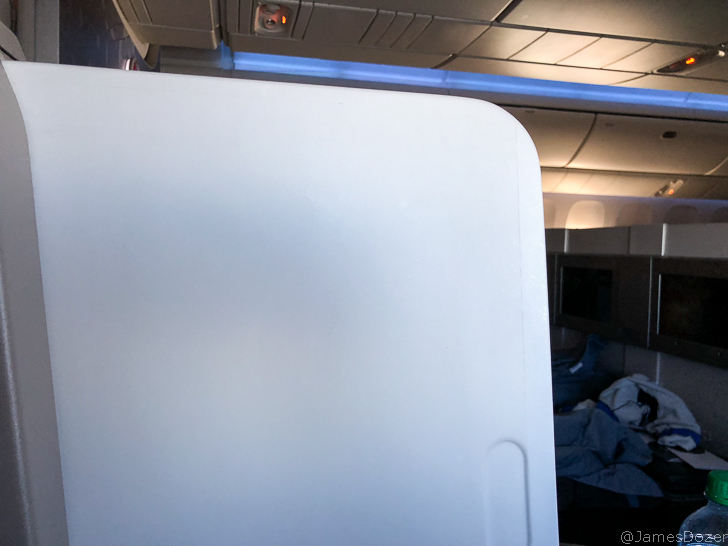 And for privacy, there is a slide out divider to separate the two passengers. It may not seem like much but it actually makes a big difference. 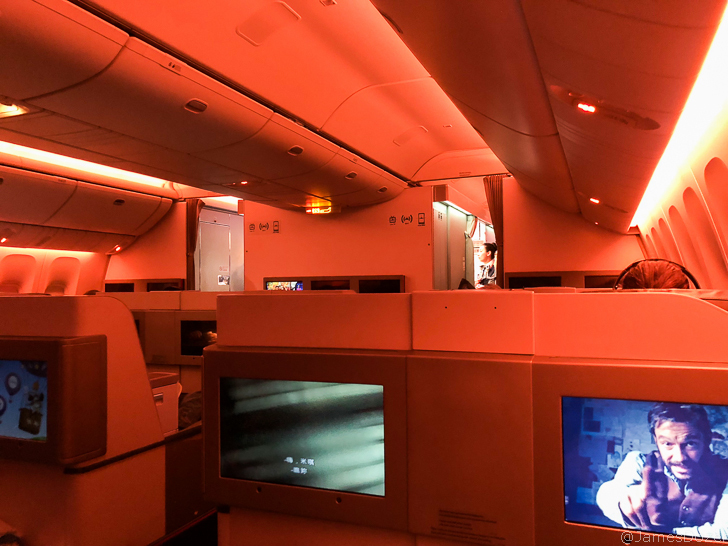 There are three lavatories for Business Class passengers; one up front and two in between the two business class cabins. 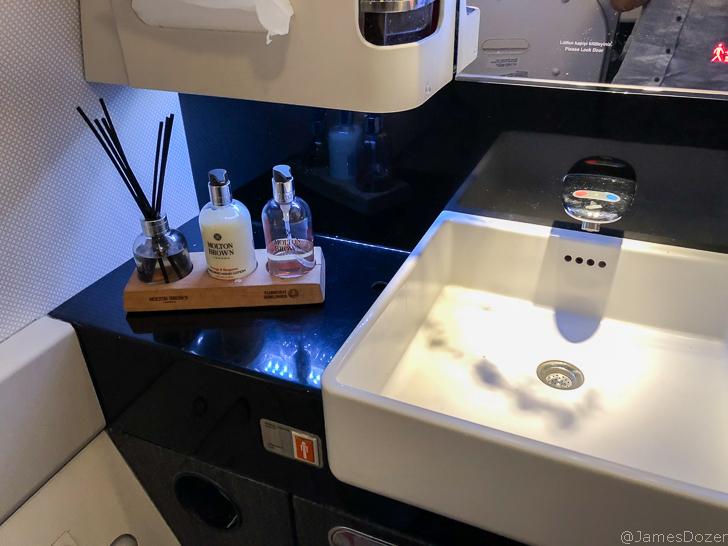 Molton Brown soap and hand cream are provided for use during flight. On this flight, I was seated in seat 7K, a window seat located on the right side of the aircraft. Row 7 is the last row in the rear business class cabin. Waiting at our seats were a memory foam back pillow, blanket, water bottle and a pair of slippers. The back pillow was great. It was soft, comfortable and provided excellent lumbar support. 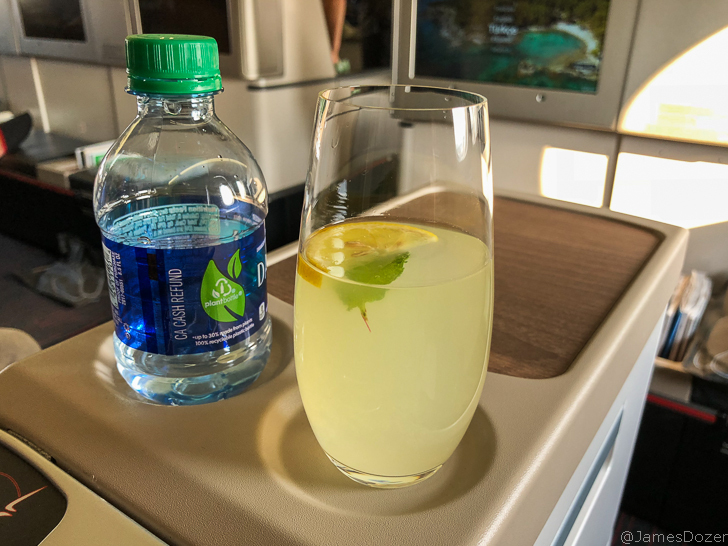 As I settled into my seat, the flight attendants came by with pre-departure beverages, amenity kits and Denon noise-canceling headphones. 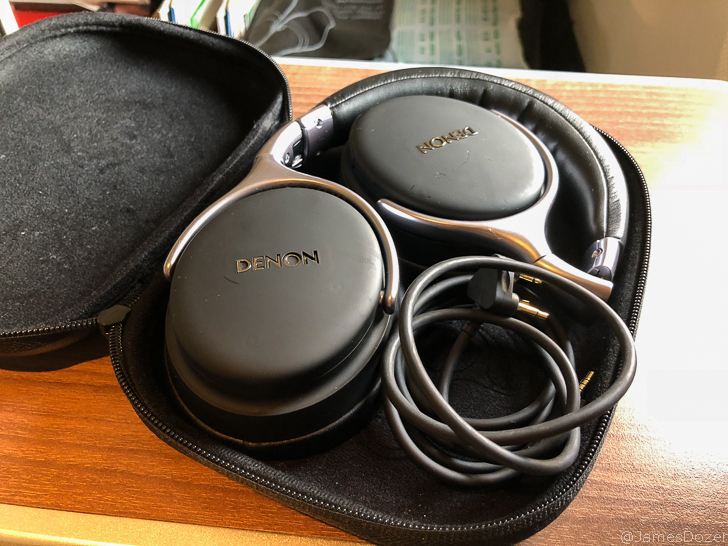 I love these Denon headphones provided by Turkish Airlines. They are soft, comfortable and work well to drown out the cabin and engine noise. I actually prefer these to my Bose Quiet Comfort 25 headphones. Acoustics-wise, I think they are similar but I think the Denons are more comfortable (and stylish). 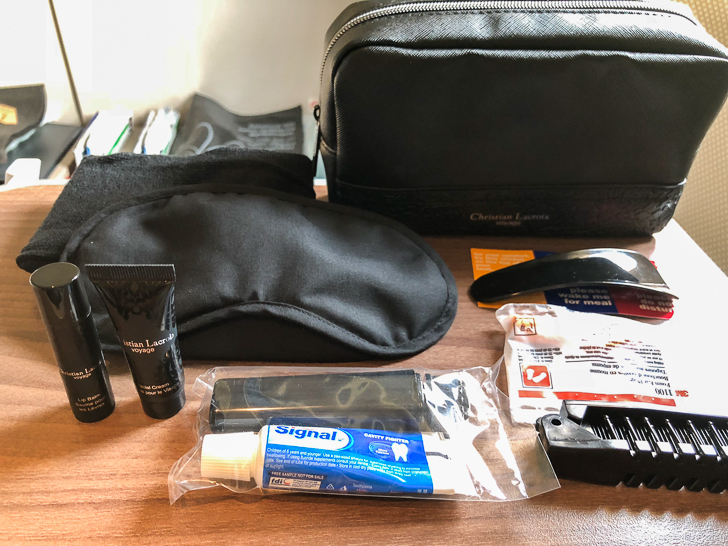 Turkish Airlines changes their amenities kits often and I really like this new one. 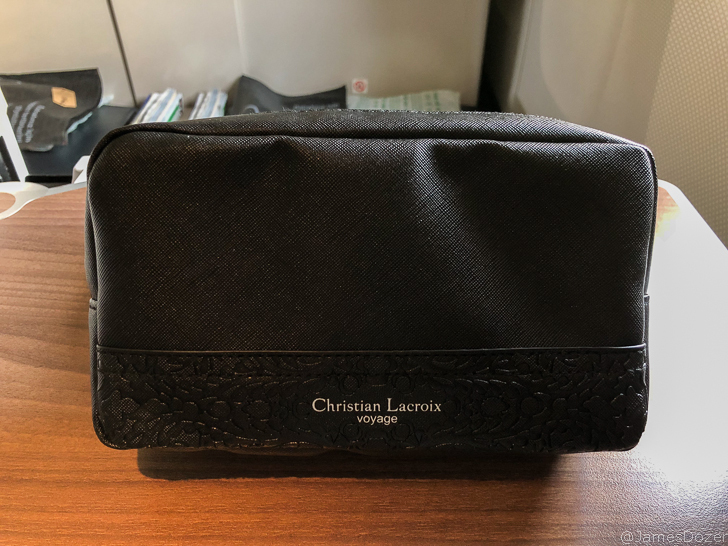 The Christian LaCroix case is sleek, simple and can be re-purposed as a cord case or makeup bag for the ladies. Inside, you’ll find eyeshades, 3M earplugs, socks, a dental hygiene kit, shoehorn, comb/brush, and Christian LaCroix branded tubes of facial cream and lip balm. The onboard chef then came by with menus and later took our breakfast orders. Once all the passengers were boarded, the Captain came on the PA to make his welcome announcement. We then pushed back from the gate and made our way to the runway. 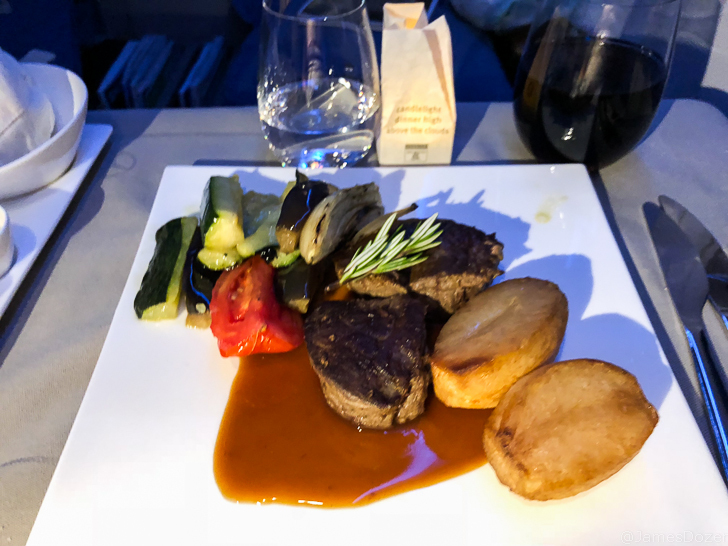 As we reached our cruising altitude, the seatbelt signs were turned off and the cabin crew prepared for our first meal service. On this flight, the entire business class cabin was full and there were two flight attendants and one chef working our section. 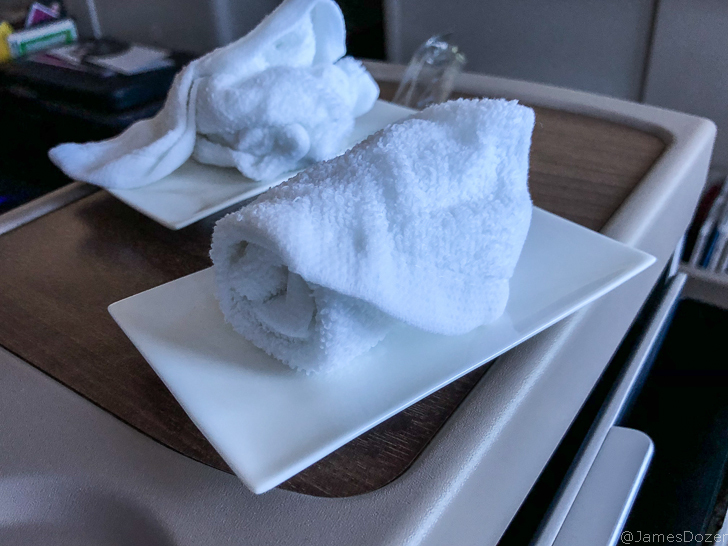 Warm towels were distributed and the flight attendants took our pre-meal, drink orders. The flight attendant then came by and asked if we wanted a turndown service. I found this a little odd as it was really soon into the flight but I guess it didn’t hurt. Turndown service included a bed sheet, another full-size pillow and a duvet. Dinner then started with a ramekin of mixed nuts, beverages and a plate of canapes. Our tables were then set with condiments and a small tea light to simulate a candle-lit meal. It’s seriously the small touches that make the biggest difference. I don’t know about you guys but food is very important to me. 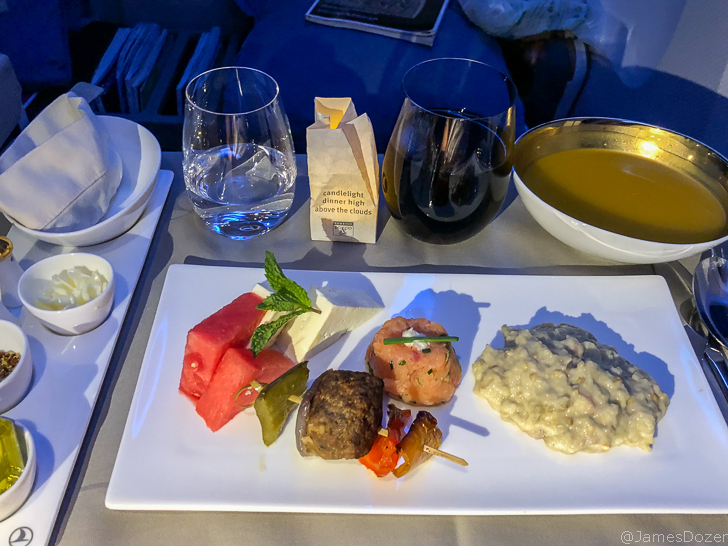 Having a great meal is one of the best ways to experience a new culture and Turkish Airlines really does a good job of providing a memorable culinary experience. 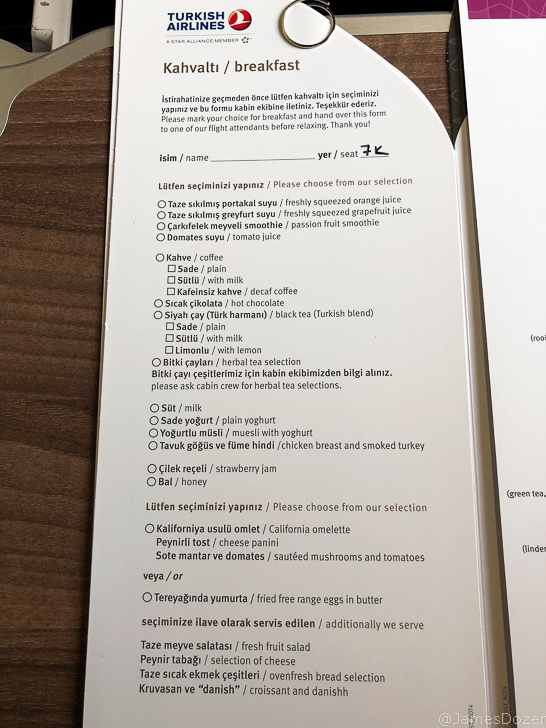 Most airlines serve you a standard 3-course meal (salad, main dish and dessert) whereas Turkish Airlines provides a true 4-course meal (appetizer, soup, main dish, and dessert) on their long-haul flights. 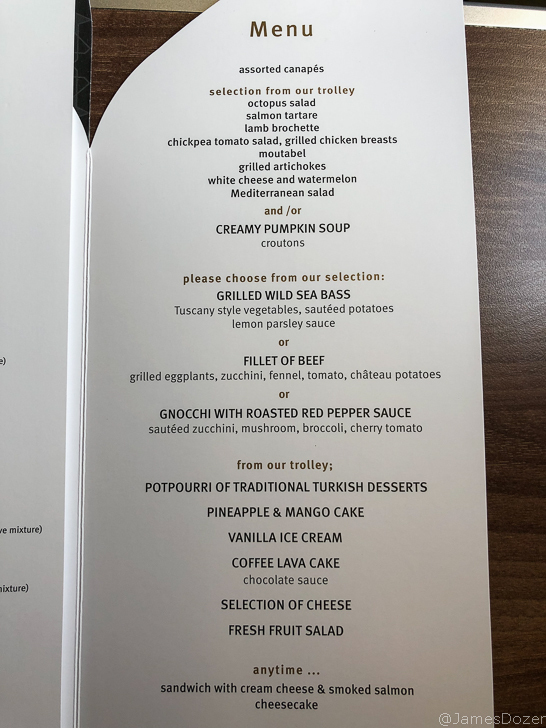 For their appetizer course, instead of giving you a simple salad or appetizer to start, Turkish Airlines will roll a cart down the aisle with all their appetizers. You can just point to and choose anything and everything you want. I love Turkish cuisine and meals like this allow me to try new things that I would normally not order in a restaurant. The creamy pumpkin soup was super delicious! It was full of flavor and had a slight kick to it. Our main courses were then brought out by the chef. I ordered the beef filet with potatoes, eggplant and zucchini. It was a tad overcooked but still tasted great. Sorry for the blurry picture. 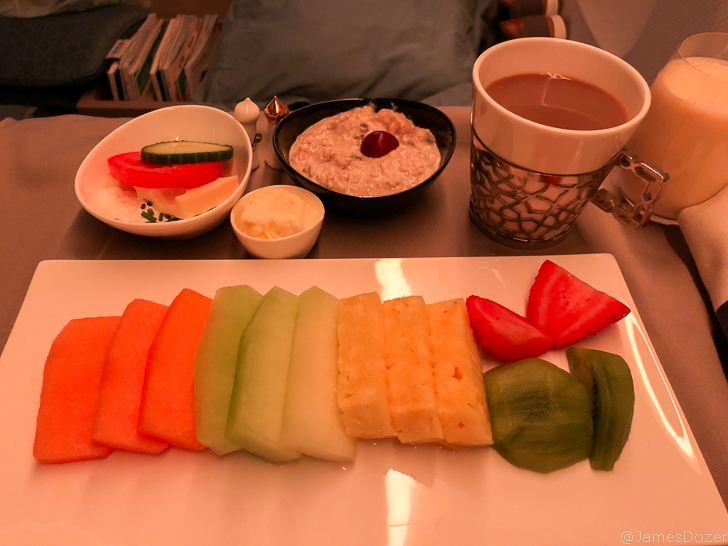 After our main course, the flight attendants came by with a fruit, cheese and dessert cart; followed by a coffee and tea service. Just like the appetizer course, all the desserts options were displayed on a trolley so we could see and order anything and everything we wanted. If you guys couldn’t tell, the catering was my favorite part of this flight. 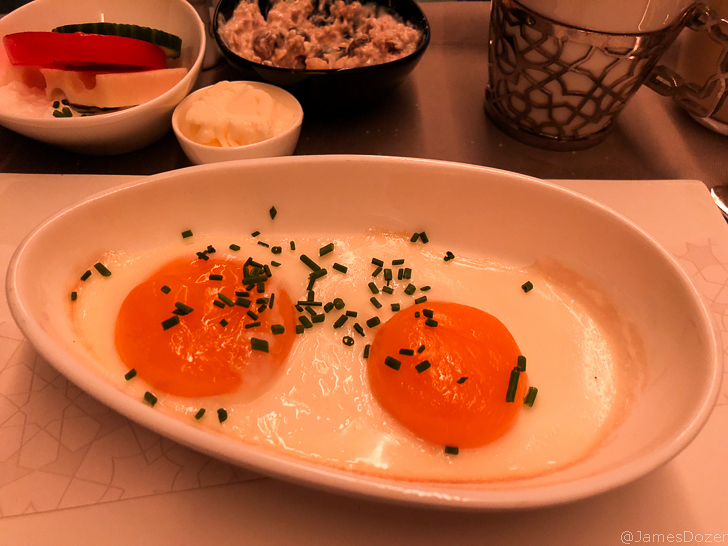 The flavors were wonderful and the dishes were authentically Turkish. 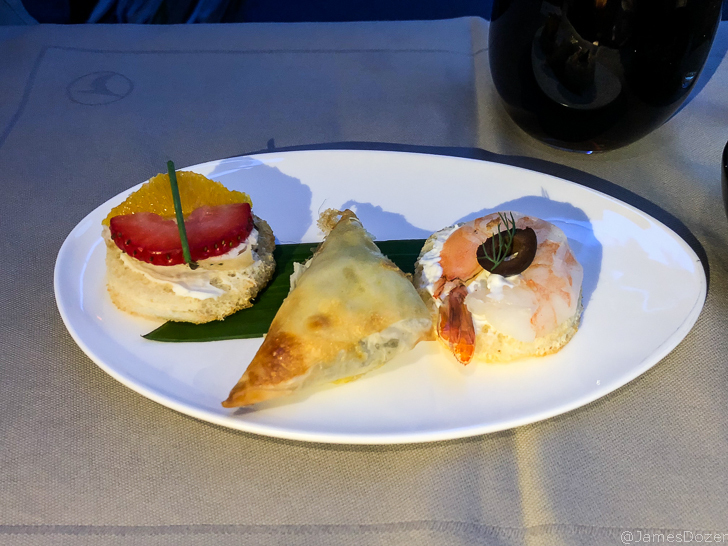 The entire dining experience was delicious, beautifully presented and would be fitting of a first class dinner service on any other airline. I loved that the items were served on a trolley so we could see everything and the fat kid in me loved that we could order anything and everything. 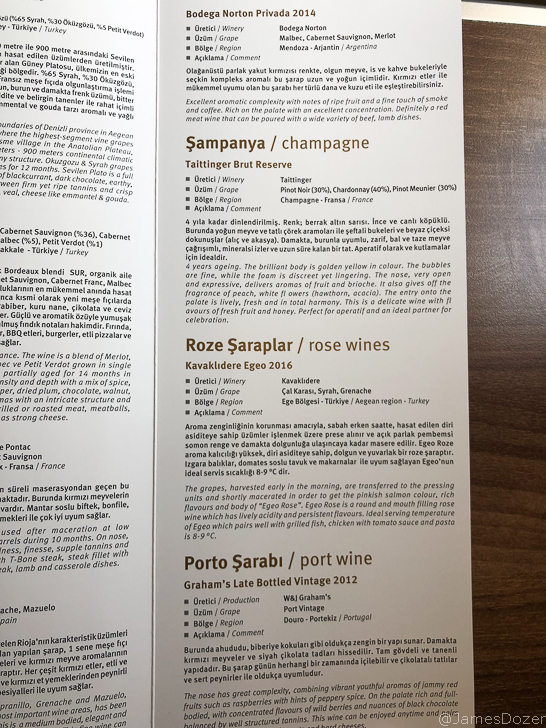 However, I do believe the catering on flights departing from Istanbul is better than the catering on flights to Istanbul. After dinner, the cabin lights were dimmed and all the shades were asked to be closed. Turk Telekom WiFi was provided on this flight and it was free for Business Class passengers. For Economy Class passengers, an hour of in-flight internet cost $10 and a 24-hour pass cost $15. Turkish Airlines’ WiFi has really improved over the years and the WiFi provided on this flight was much faster than on previous flights. That being said, it still wasn’t the fastest and you’ll be limited to small data files. It was great for social media and messaging apps but not really good for anything streaming. 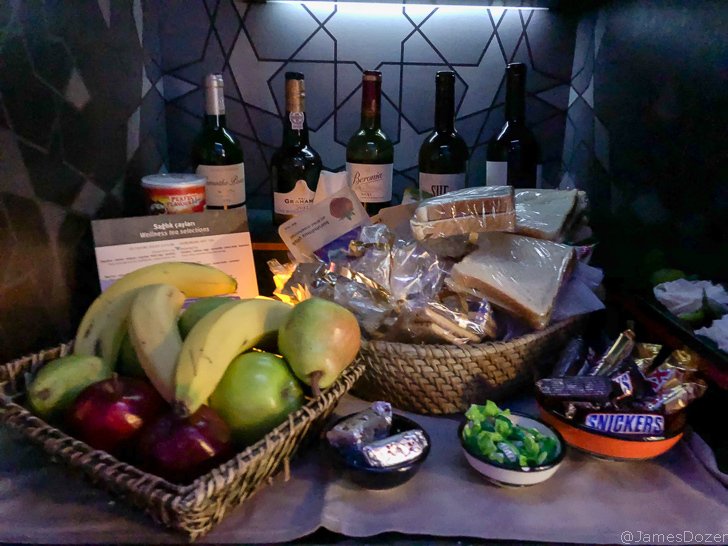 In between meals, small sandwiches, snacks, and drinks were provided in the galley. 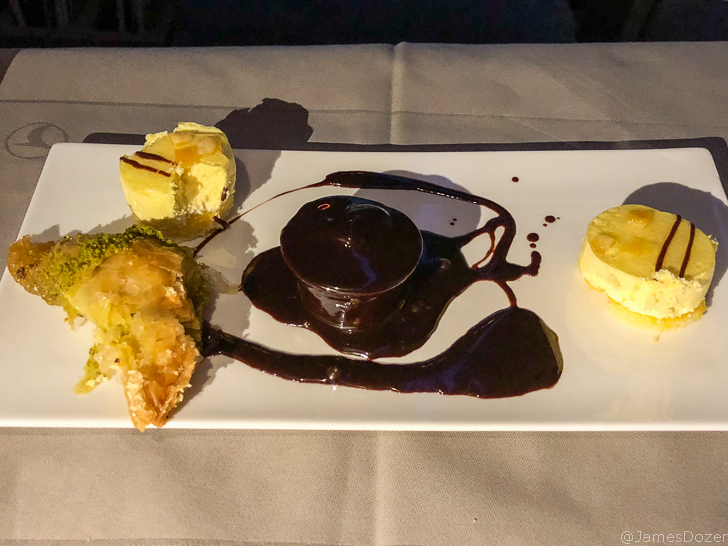 About two hours before our arrival into Istanbul, the cabin lights were turned on and our pre-arrival meal was served. Our breakfast orders were already submitted earlier in the flight so the flight attendants just brought out our meals as we woke up. Breakfast started with a smoothie, muesli, cheese and a generous fruit plate; followed by fried eggs. 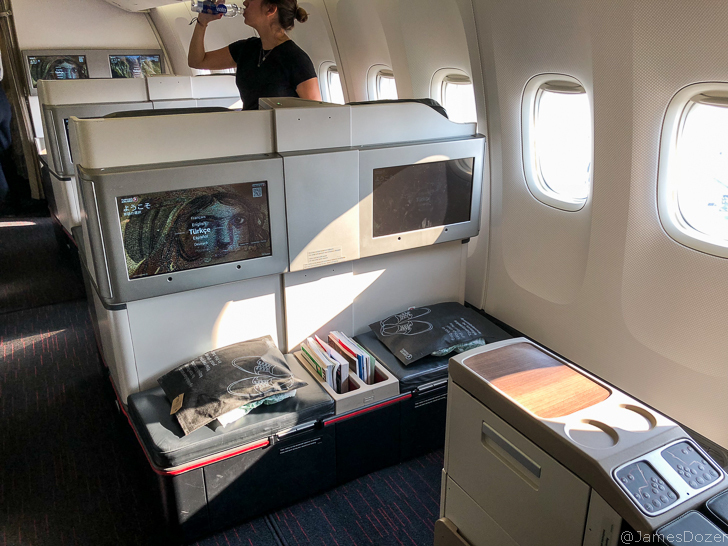 Overall, this was another great experience flying with Turkish Airlines Business Class. I know many people complain about their outdated configuration but these seats aren’t terrible. They do lack privacy and direct-aisle access for all passengers but they are soft and comfortable for both lounging and sleeping. 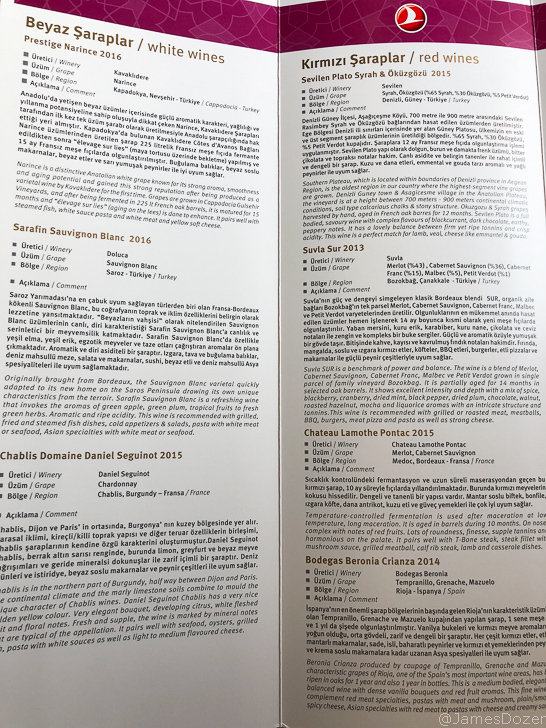 But what I really love about Turkish Airlines is their soft product. 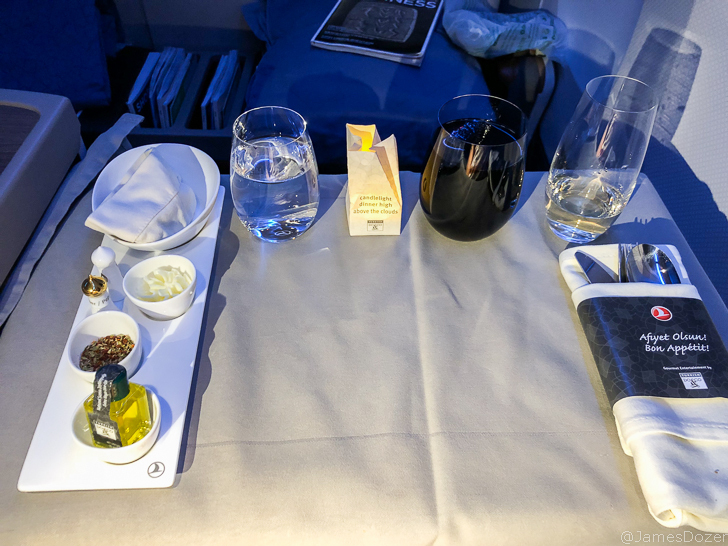 Their catering is unmatched by any other airline and the amenities provided onboard (amenity kit, headphones, bedding, etc) are top-notch. 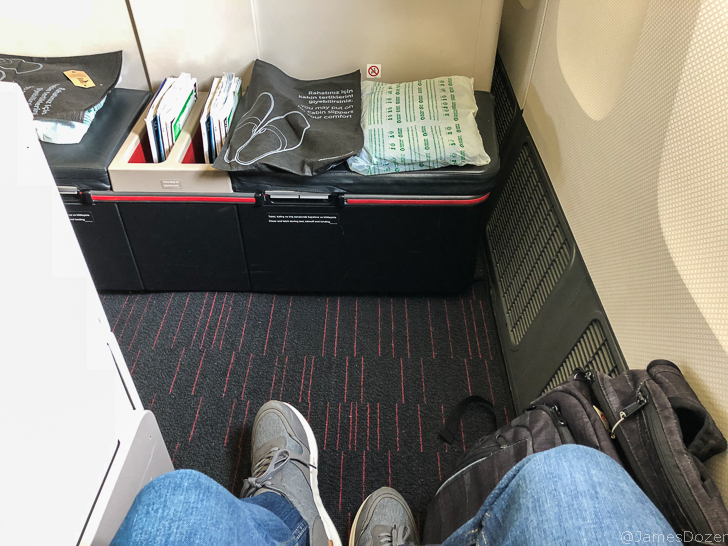 Have you flown with Turkish Airlines Business Class lately? If so, please your thoughts with us in the comments section below. Thanks for reading!